Key Take Aways from Senate Investigations re: Foreign Banks and “Offshore Tax Evasion”: U.S. Citizens Residing Overseas have Become a Focus of the Government.
. . . focused primarily on Swiss accounts held by U.S. residents, ignoring the over 6,000 accounts opened by U.S. nationals living outside of the United States. . . . 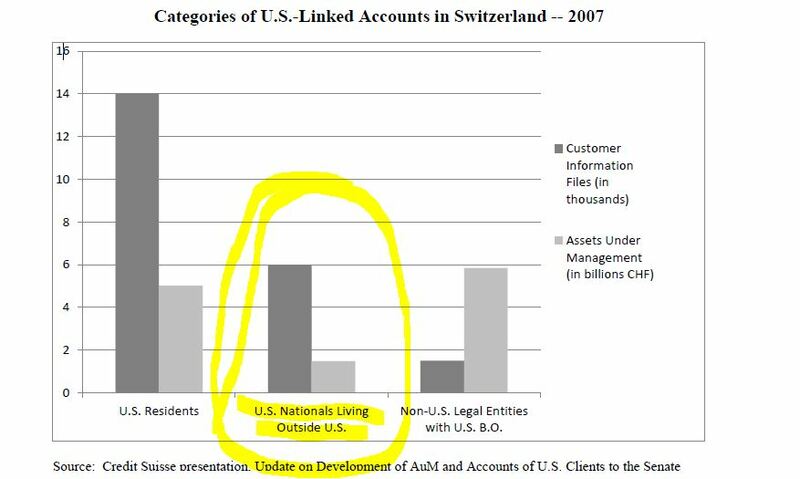 It was not until 2012, that the bank expanded the Exit Projects to include a review of the thousands of Swiss accounts opened by U.S. nationals living outside of the United States.. . .
undeclared offshore accounts that, potentially, number in the millions. According to the Taxpayer Advocate, “While 7.6 million U.S. citizens reside abroad and many more U.S. residents have FBAR filing requirements, the IRS received only 807,040 FBAR submissions in 2012,” signaling “significant information reporting noncompliance.”69 2013 Annual Report to Congress — Volume One, Taxpayer Advocate Service, “OFFSHORE VOLUNTARY DISCLOSURE: The IRS Offshore Voluntary Disclosure Program Disproportionately Burdens Those Who Made Honest Mistakes,” at 229. This report seems to get off track by not distinguishing between normal U.S. citizens who are living out their lives in their country of residence, as opposed to U.S. nationals who are intentionally attempting to evade taxes, filing false documents, not filing returns, or otherwise intentionally violating U.S. law. All of these 7.6 million U.S. nationals living around the world are being lumped together by the government with U.S. resident citizens, irrespective of the facts of each individual and family. This entry was posted in Criminal Tax Considerations, IRS Audit Techniques - Expatriation, Tax Policy. This is a bit of a Bombshell – If the IRS Criminal Investigation (“CI”) is investigating U.S. citizens renouncing their citizenship? Which countries do most Lawful Permanent Residents (“LPRs”) reside in – if they are not living in the U.S.?